Archbishop of Canterbury Says He Speaks in Tongues—Does the Bible Agree? 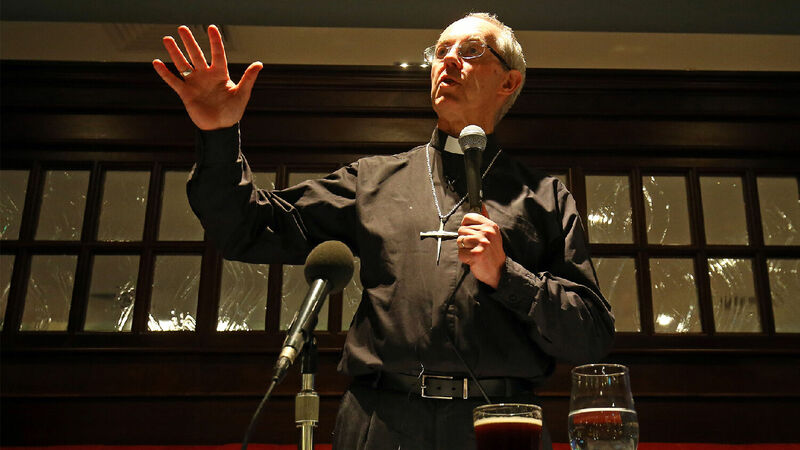 Archbishop of Canterbury Justin Welby takes part in a question and answer session with locals at the Wetherspoons Royal Victoria Pavilion in Ramsgate, Kent. Is the ability to ‘speak in tongues’ evidence that a person has received the Holy Spirit? “I pray in tongues every day,” said archbishop of Canterbury Justin Welby in an interview with Premier Christian Radio published on January 18. Welby has previously said that he first started speaking in tongues at age 19 after becoming “overwhelmed by the love of God” while studying the New Testament. Now he is the most senior bishop in the Church of England. Welby is far from the only Christian who speaks in tongues. For some charismatic evangelical groups, such as Welby’s home church of Holy Trinity Brompton, and for many Pentecostal Christian denominations, “speaking in tongues” is a central tradition. There is even evidence that the practice is growing in popularity in the United States. The National Congregations Study reported in 2014 that “speaking in tongues” in American congregations increased 5 percent during the previous 15 years. The study showed that among the 15 percent of American congregations that describe themselves as independent of any denomination, 45 percent reported having members who regularly speak in tongues during services. Those who engage in tongue-speaking—or glossolalia as it is formally called—claim it is a Bible-based practice that demonstrates the presence of the Holy Spirit in them. Usually this is manifested by people in the congregation bursting into utterance of unintelligible syllables, or as in Welby’s case, speaking such sounds in private prayer. Linguist William Samarin defines glossolalia as a purely physical phenomenon. It is “unintelligible extemporaneous post-babbling speech … without having consistent syntagmatic structure and that is not systematically derived from or related to known languages,” he writes in Language in Society. What is the truth about speaking in tongues? Is it evidence of the Holy Spirit—or babble? Is it necessary for salvation—or is it nonsense? Could it be dangerous? What do the Scriptures say, and how does that apply to those striving to follow Christ today? It is important for us to “prove all things” (1 Thessalonians 5:21) on this topic, by studying what the Bible says about it. And when the day of Pentecost was fully come, they [the 120] were all with one accord in one place. And suddenly there came a sound from heaven as of a rushing mighty wind, and it filled all the house where they were sitting. And there appeared unto them cloven tongues like as of fire, and it sat upon each of them. And they were all filled with the Holy [Spirit], and began to speak with other tongues, as the Spirit gave them utterance. Never has such a supernatural display occurred before or since. Yet the modern sect calling themselves “Pentecostal” claims to repeat this experience. But in their meetings no such sound comes from heaven. No supernatural divided tongues of flaming fire sit on their heads. Some do break out in a kind of gibberish supposed to be some foreign language, but emphatically not anything like that happened on this one day of Pentecost in a.d. 31. Acts 2 continues showing that those who witnessed the 120 being given the Holy Spirit and then heard them speak were from numerous nations. Egyptian Jews were present, as well as Greeks, Mesopotamians, Libyans, Medes, Cretans, Parthians, Romans and more. The remarkable thing was that “every man” from these various and far-flung locations heard the disciples who had received the Holy Spirit “speak in his own language” (verses 5-13). Now notice carefully. Every man—that is, each individual—heard them, the 120, all speaking in his own native language. The Greek heard the 120 speaking the Greek language. The Parthian heard the same 120 speaking in the Parthian language. The Mede heard the 120 speaking the language of the Medes. They understood what was being said. They got the message! Today, in “Pentecostal” meetings one person may break out in a kind of gibberish that others in the meeting do not understand. He explained that this is not discussing languages unknown to mankind, as many Pentecostals argue, but foreign tongues unknown to the bulk of the people present at the meeting. “It says if one speaks in a foreign language there must be an interpreter so the others can understand,” Mr. Armstrong wrote. “Pentecostal” people have been deceived into thinking that one is what they called “saved” when one receives Jesus Christ as his personal Savior. They consider “the baptism of the Holy Spirit” evidenced by speaking in “tongues” as a subsequent imbuement of power. I have had a great deal of experience with these people. This “baptism” as they call it seems to loosen their tongues in what they call an “imbuement with power,” which, in practice, means power to speak emotionally, often braggingly. There is no statement in Scripture that you must speak with tongues to prove you have received the Holy Spirit “baptism.” No scripture says, “by their tongues ye shall know them.” But the Scripture does say, “by their fruits ye shall know them!” (Matthew 7:20). [T]he fruits of the Holy Spirit—love, joy, peace, patience, kindness, gentleness, goodness, meekness (most “tongues” people are not meek, but loud-mouthed and bragging), temperance, faith— these things in one’s life cannot be counterfeited. They are not natural. No one has sufficient willpower to force himself to show always these fruits in his life. It requires the miracle of the love of God shed abroad in our hearts by the Holy Spirit (Romans 5:5). Satan has no counterfeit for that! Mr. Armstrong also recognized that the Bible discusses some genuine instances of the practice in Acts 10-11 and 1 Corinthians, which occurred years after the a.d. 31 Pentecost. But he emphasized that it was common human languages of the day that the converts were suddenly, miraculously speaking. He wrote: “We should banish all prejudice against the true manifestation of tongues which is the ability to speak in real languages. But we should get the tongues into the proper scriptural place of importance.” Continuing, he wrote, “Paul said he would rather speak just five words with his understanding, that he might teach others also, than ten thousand words in an unknown tongue” (1 Corinthians 14:19). To understand the life-long process of yielding to God and learning to worship Him in spirit and in truth, order your free copy of Mr. Armstrong’s potentially life-changing book Mystery of the Ages.